Windhoek City Police officer clash with vendor (file photo). RESIDENTS of Karasburg last Friday took to the streets to protest against alleged police brutality. The protest follows claims by residents Frederick Alberts and Benedictus Isaak that police officers recently assaulted and pepper-sprayed them for no apparent reason. Alberts told The Namibian that he had opened a case of assault against the concerned police officers. The residents stated in the petition which they wanted to hand over to the police commander - but could not do so because he was out of town - that they want officers committing acts of assault the arrested, and that their transgressions not be treated with kid gloves because they were violating other people's rights. "Assault with intent do to grievous bodily harm is an offence that warrants incarceration. We demand justice, and want to see it to reign supreme" the petition reads. The residents stressed that they were well-aware of their rights, although it might seem that they are uneducated, uninformed and vulnerable. They thus urged police inspector general Sebastian Ndeitunga to investigate cases of assault made against police officers. "We demand that all police officers committing these crimes [should] be held accountable for their actions and prosecuted," the petition reads. The residents further said they want their voices to be heard without being assaulted and racially profiled, and that they should not be treated with hostility by the police. 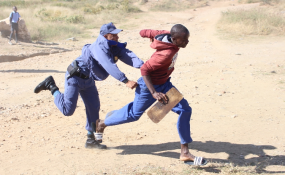 //Kharas regional commander, commissioner Rudolf Isaak yesterday confirmed that the residents had staged a protest against police brutality on Friday. He said he could not comment further since no petition was handed over to the police because the local station commander was out of town. Isaak said residents were expected to hand over the petition to the police today.